Bio: This morning the lastest edition of the Pastel Journal dropped through the letter-box; this is one of the highlights of the year, as it is the issue with the Pastel 100 award winners. No one can accuse the Pastel Journal of dishing up the usual suspects – there is always something new, someone new. Last year I was very happy to discover the landscapes of Turkish artist Javed Soleimanpour. 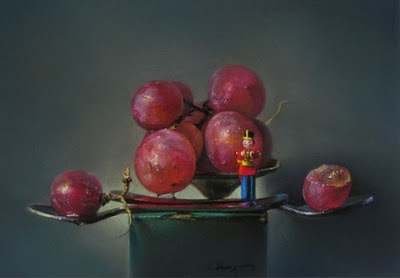 This year the still lifes of Argentina-born Abel Marquez are a real find. Abel Marquez was born in Trelew, Patagonia. He left his first choice, medicine, to enrol in in the School of Art, University of Cordoba in 1986, and graduated with a Bachelor in Fine Arts in 1990. He took up pastel when he moved to the USA, basing himself in Miami, painting professionally in the medium from 2005, and immediately beginning to amass awards, culminating in the Ruth Richeson/Unison Pastel award in the current Pastel 100. Medium: Pastel; oil; charcoal; watercolour. Navigation: This website is in English and in Spanish. Image View: The galleries consist of thumbnails one views by running the mouse over the numbers at the base of the viewer. Information on the chosen thumbnail (title, medium,dimension) is displayed to one side. Click on the appropriate number to see the enlarged image; you can then use a “zoom” feature to focus on the detail of any portion of the image if you so wish. The image viewer is Adobe Flash player, hence download is not possible as such. The Guardian is 8 x 11.5 ins.